The US early warning radars are phased-array surveillance radars used to detect and track ballistic missiles targeted at the United States. The National Missile Defense (NMD) system would be a fixed, land-based, non-nuclear missile defense system with land- and space-based detection systems capable of responding to a limited strategic ballistic missile threat to the United States from a rogue nation. Among the elements proposed for use by the NMD Program are the PAVE PAWS (PAVE is a US Air Force program name, while PAWS stands for the Phased Array Warning System) early warning radar (EWR) soon to be at Clear Air Force Station* (AFS) in Alaska (early 2001) and the existing PAVE PAWS EWRs at Beale Air Force Base (AFB), California, and Cape Cod AFS, Massachusetts. 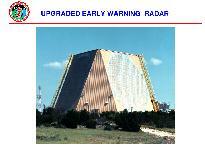 Upgrades to these existing early warning radars would replace electronic hardware and computer software at existing radars at Clear AFS, Beale AFB, and Cape Cod AFS in support of the NMD program. The hardware modifications would consist of replacing existing computers, graphic displays, communication equipment, and the radar receiver/exciter to perform the NMD mission (i.e., identification and precise tracking of a ballistic missile launched against the United States). The EWR software would be rewritten to incorporate the NMD function and allow the acquisition, tracking, and classification of small objects near the horizon. The UEWRs would be able to search for different types of missiles, distinguish hostile objects such as warheads from other objects, and provide this data to other NMD elements using improved communications systems. The radiated peak and average power, radar antenna patterns, and operating bands of the UEWRs would remain unchanged from current operations. The PAVE PAWS radar design included the possibility of a future growth option that would include the activation of additional radar elements and therefore an increase in total RF power. The proposed action as part of the NMD mission does not include this growth option. Once upgraded, the current EWR operations would continue with the addition of conducting NMD missions and training exercises. Training for the NMD program is expected to represent less than 1 percent of the total EWR usage (approximately several hours per year). At all other times, the UEWRs would continue to perform their current EWR missions. In either case, radar outputs would be unchanged from current levels. There would also be no changes in the number of personnel required to operate the radar or in the amount of hazardous materials and waste generated by the UEWR when compared to the EWR.